This is the first in a series of overspeed warm up skating drills. The players split into two lines in opposite corners of the rink. Two or three players can go at each time. Typically two is better unless you have a lot of skaters. The objective of this drill is to keep the feet moving as fast as possible around the circles. Make sure players are not sacrificing good cross-over/cross-under technique for quicker feet. In the middle of the ice the players will need to keep their head up because they may intersect with players comign from the other line. Another skating progression to incorporate into a warm-up with a lot of skating. 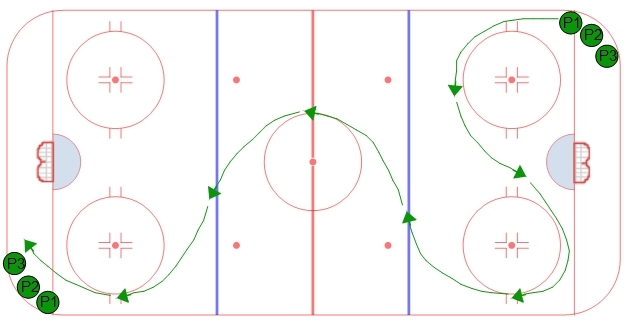 This has lots of variations and it is easy to come up with your own twists to this drill. Pucks are also easy to incoporate many ways. A few variations that incorporate pucks will soon be published. This progression still focuses on quick feet and an emphasis on overspeed skating. 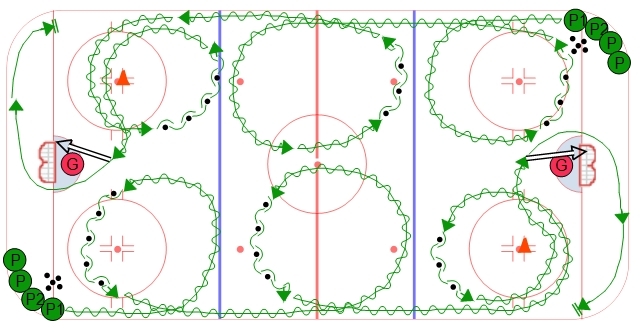 In this variation the skating route is a larger circle which should allow for more speed as they leave the zone. The players should stay just inside the blue line and just inside the dots as they make a large circle in the zone. Explain to the players their power will come from the cross under and to use a full extension so they get the most out of each stride. 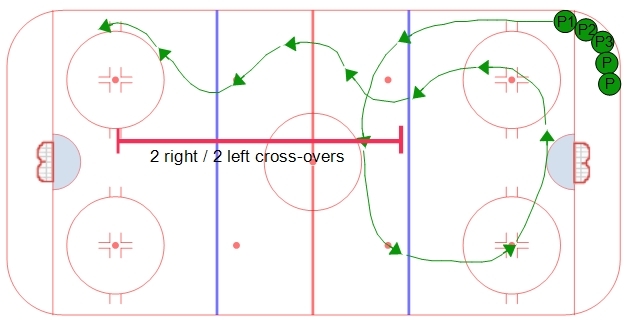 As the players leave the zone they will do two cross overs in each direction all the way down the ice. Quick lateral movement that is gained by exploding off the outside edge of the leg that is crossing under should be a point of emphasis.